If you have a cavity diagnosed, or if you suffer dental damage, you can be upset over the idea that your smile will never be the same again. 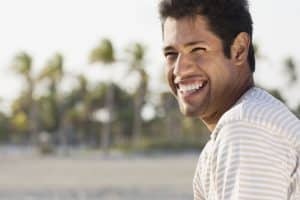 You can feel confident that restorative dental work will protect your tooth, but worried that it will leave you with a distracting restoration that disrupts your appearance. What you should know is that it is possible to receive a discreet restoration, which will help you avoid any impact on how you look. A porcelain-made dental crown will offer important support, while also helping you retain a smile that looks natural. Dental crowns provide total coverage for a tooth above the gum line. They are meant to provide that support permanently, which means that durability of highly important. With a porcelain dental crown, you can feel confident that your crown will hold up against standard biting and chewing pressures, while also being happy with how it looks. It should be noted that if you need a crown for one of your molars, which face more pressure when you bite and chew, you may benefit from having a metal crown placed. While these teeth are difficult to see, meaning they have less impact on your appearance, you do have the option of receiving a zirconia crown, which looks like a natural tooth, and provides more durability than porcelain. Restorative work may be able to preserve your smile, but preventive dental care is still highly important. Keeping up with regular dental checkups, and practicing good oral care habits at home, can help you avoid problems that make restorative care necessary. You can count on expert restorative care when you seek treatment with Michael J. Young, DDS. Our office is proud to provide patients with treatment that can protect their oral health, while also preserving their appearance. Our practice proudly serves families from Breaux Bridge, Broussard, Scott, Youngsville, and surrounding communities. To learn more, contact us today at our Lafayette, LA, dentist’s office at 337-237-6453.